There's an adorable new addition at the Albuquerque BioPark Zoo. A three-week-old white rhino calf has arrived from Florida to his new home at the BioPark Zoo, but visitors will have to wait a few months before meeting him until he's accustomed to the staff and the three adult rhinos he's living with, Bertha, Lulu and Bernie. "He's the hit of Albuquerque," Zoo Director Rick Janser told ABCNews.com. "The citizens unfortunately can't see him yet, but we're taking video of him and playing it on a monitor so they can see how rambunctious he is. We're getting the staff used to him. He's a very social animal." When the baby rhino was born in Florida's White Oak Conservation Center on Oct. 30, he didn't establish a strong bond with his mom, so the next-of-kin, if you will, was BioPark. "He is our animal. His dad belonged to us when we sent him out," Janser explained. "In the zoo world, you usually you do breeding loan agreements. The first offspring belongs to female, and the second belongs to the male. "Since the mother rejected this one, White Oak didn't have the staffing to hand raise him, so they asked if we wanted to take him back." Transporting the animal from Florida to New Mexico was quite an adventure for the now 180-pound baby. The zoo sent two staff members, manager Lynn Tupa and veterinarian Ralph Zimmerman along for the ride on the Fed Ex plane where the rhino was shipped in a crate specifically made for him, equipped with latch doors that can open for feeding time. "They flew out on a Monday, and spent all Monday and Tuesday getting to know the husbandry of the animal," Janser said. "How to mix the formula, how to hold the bottle, and what he liked as far as interaction. Wednesday morning they put him in a crate and loaded him on a Fed Ex plane to Memphis, had a four or five hour layover in Memphis, then flew him into Albuquerque." Last Thursday the rhino calf even got a special bottle-feeding from Albuquerque's Mayor, Richard J. Berry. 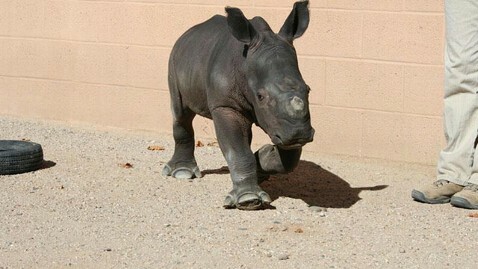 "We are pleased that Albuquerque can offer a good home to this rhino calf," Berry said. "We know that our Zoo will give him top-notch care, and what a great treat for families to watch this little guy grow up." The baby rhino has not been named yet, but BioPark Facebook fans can visit their page to vote on their favorite name choice. Chopper is currently in the lead, but his other options are Linus, Clyde, Titan and Kgoski.